If you're new to FlowStone and don't want to commit to the full price up front then you can buy the current version at a reduced cost with no upgrade cover included. If you like it then you can upgrade to any future version at a later date and you'll get 12 months upgrade cover included. Existing customers who own any of our previous products (including SynthMaker) can use the Upgrade option below. Make sure you log in using your existing SynthMaker or FlowStone login details. Please contact us if you have any problems. Please to the support area before purchasing. 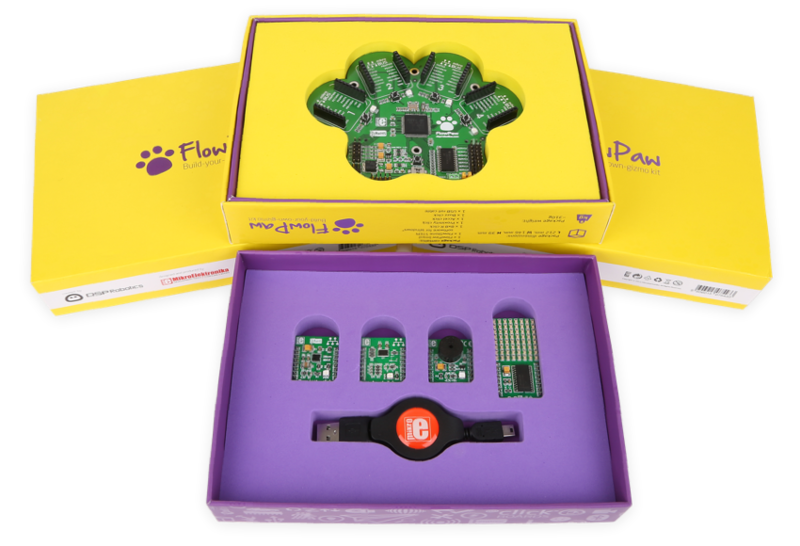 FlowPaw is a multi-purpose, expandable, electronics board that plugs straight into your PC and works seamlessly with FlowStone to make programming a piece of cake. A copy of FlowStone STEM is included with the package! Our software is constantly evolving so instead of saving up features for a traditional annual upgrade we deliver them whenever they are ready. Typically we have between 3-6 months between new versions but this isn't set in stone so you could see less or more time between releases. One of the perils of buying software is finding that a new version is released just after you made your purchase and you end up having to pay again to get it. To help avoid this we include 12 months upgrade cover as standard. This means that you can buy the latest version of FlowStone and know that you'll get any new versions we release in the next year completely free of charge. Q - What happens if I elect to buy the FlowStone with no upgrade cover? You get the latest version of the software to use for as long as you like. However, you will not have access to any of the updates we release after you purchase. You can of course upgrade at any time which will give you the latest version and 12 months upgrade cover thrown in. Q - What happens when my upgrade cover runs out? You will continue to have access to the latest version of the software (and all previous versions) but you won't get any of the new versions unless you upgrade. Q - Can I add to my upgrade cover before it expires? Yes, you can do this at any time. Any additional months purchased will be added to the time you still have to run. Q - If my upgrade cover has expired can I restart it again? Yes. Just purchase an upgrade. This will resume from the date you purchase - there is no backdating to cover any lapse period. Q - Do I need any licence keys to activate the software? No. You will need to log on to our download area and from there you can download an install program for the software. This install is for your use only. You don't need any activation keys and no online activation is required, just install and off you go. Q - Can I run the software on my laptop as well as my desktop? Yes, you may install the software on any number of your own computers so long as the only person that uses the software is you.